The amount of satellite imagery has increased significantly over the last five years and is expected to sky-rocket in the coming years with thousands of Earth Observation (EO) satellites planning to be launched. Advances in multi-source data analytics leveraging Artificial Intelligence (AI), Cloud computing and Internet of Things (IoT) have huge potential to disrupt traditional business, drive Digital Transformation and create tremendous long-term value. Leading Earth Observation (EO) satellite operators, new constellations and AI Analytics startups all gathered at the two-day Euroconsult Summit on Earth Observation Business in Paris in September to discuss their outlook on the market. In this report, we share our observations of technology and business trends transforming the industry. We also highlight new opportunities and challenges in this dynamic market. Incumbents and new entrants alike recognize the value of AI analytics in delivering applications and actionable insights to drive adoption of the enterprise market. EO is one of the fastest growing satellite applications. The smallsat revolution over the past years enabled many new players to launch lower-cost new constellations backed by venture capital. EO satellites now account about one third of the 1,700+ operational satellites orbiting the Earth. Moreover, the number of EO satellites to be launched is expected to accelerate in the next few years with over 30 commercial satellite imagery constellations planned for the coming decade, according to NSR. EO data analytics is a nascent market. Global EO data and services revenue were over $3 billion last year, while growing, remains a small part of the $260 billion+ satellite services market. EO operators face continued pressure on data pricing from growing competition and overcapacity. At the same time, they are moving up the value chain by developing data platforms with analytics providing information and insight, instead of selling only raw data. Cloud based multi-source data platform with analytics powered by AI machine learning is key to unlocking the value of rapidly growing EO data. In other words, fusion of multiple data sources (aerial, ground sensors, cell phone, social media, weather, location and etc.) and leveraging AI to deliver useful insights. Incumbents, new operators and analytics startups are forming partnerships to fill their capability and distribution gaps. Further consolidation in the ecosystem is likely, in our view, to acquire talent and to build a scalable, subscription-based business model. Defense remains the largest customer and key near-term driver of EO data and analytics. This is based on DigitalGlobe and Planet’s government contracts; Almost all of the leading new constellations (Planet, BlackSky and Urthecast) and AI analytics startups (Orbital Insight, Descartes Labs) are bullish about the defense & government market. The DoD launched the Defense Innovation Unit Experimental (DIUx) in 2015 to accelerate commercial innovation to help solve real defense problems. Space is one of DIUx’s area of focus; it has backed startups in smallsat SAR, AI analytics and small rockets. Defense customers want rapid delivery, higher refresh of data and analytics. Timely answer from massive amounts of data is key. The US National Geospatial Intelligence Agency (NGA) has shifted its focus from commercial imagery acquisition to analytics and data from new sensors including Synthetic aperture Radar (SAR), video, radio frequency, infrared and etc. Quick turnaround, higher frequency of Synthetic Aperture Radar (SAR), combined with optical and other data are key to developing applications to open up new markets. SAR is complementary to optical imaging because it can capture images of the Earth in darkness and under cloud. Incumbent SAR players (MDA, E-Geos and Airbus) are opening up data access through online platform and see SAR as a fast-growing market. Smallsat SAR players like ICEYE is expected to bring timely global coverage with hourly revisit in the coming year. The commercial market is not as mature as people think and requires a lot of education. Expanding into a new market vertical requires customized consulting to understand customer needs. Companies in the space need to provide more bespoke work in the beginning to develop repeatable and scalable solutions. There is a learning curve of 18-36 months to move into a new market segment. Domain expertise is key to understanding the user case and deliver useful insights. While AI is a powerful analytics tool, the machine is there to complement the human, not replace. Highly accurate and reliable AI analytics are derived from models based on a deep understanding of the user case, combined with remote sensing and machine learning expertise. Expanding into new verticals through partnerships with domain experts. EO operators are moving up the value chain by developing data platforms with analytic tools, while AI Analytics startups like Orbital Insight, Descartes Labs, and Ursa have been successful in selling insights to hedge funds and traders in the Financial Services market. Operators and analytics startups recognize that partnerships with domain experts are important for expansion into new vertical markets such as Oil & Gas, Agriculture, Infrastructure Monitoring, Insurance and etc. Access to good quality AI training data remains challenging. Satellite imagery was scarce until recent years, and it can be labor intensive and time consuming to develop good training data. Most new constellations will not be operational until 2020. Many analytics startups use free government data, instead of paying for higher resolution data. Incumbent EO operators (DigitalGlobe, Airbus, e-Geos, and ImageSat) are focused on expanding into analytics and building their next-generation constellations. They are building data delivery platforms with AI powered analytics as their traditional business of selling imagery is under enormous pressure from growing competition. Moreover, customers want useful insights extracted from the data, not raw pixels. While each operator has a different market focus and strategy, most agree that rapid delivery of multi-source data analytics powered by machine learning, AI is key to the future of geospatial intelligence. Strategic partnerships play an important role in filling capability gaps and developing vertical specific solutions. Airbus and Planet recently joined forces to bring new products to market, combining the lower resolution but daily global coverage of Planet’s cubesats with Airbus’s fleet of high-resolution satellites. Airbus also announced their first analytics partnership with Orbital Insight at the conference to build a suite of analytics on its digital platform OneAtlas. This agreement provides Orbital access to Airbus’ massive data archives. Airbus is optimistic about High-Altitude Pseudo Satellite (HAPS). The solar-electric powered stratospheric UAV would provide persistent coverage with different sensors such as higher resolution streaming video. Airbus sees HAPS as complementary to satellites. Maxar Technologies was created almost a year ago from MDA’s acquisition of DigitalGlobe (DG) to create vertically integrated, end to end solutions for the new space economy. The company is opening up access to MDA’s radar with DG’s optical online delivery platform GBDX. DG expects analytics to be a key growth driver, with renewal of the National Geospatial-Intelligence Agency (NGA) EnhancedView for $300 million a year; it was one of ten companies selected for a new NGA award for content management of community-sourced data on topographic and human geography under a 10-year contract with a potential value of $920 million. E-Geos is leveraging its strength in SAR (Synthetic Aperture Radar) and VHR (Very High Resolution) optical satellites with multiple partnerships to build Big Data analytics; it launched a real-time cloud-based maritime monitoring platform in July. It has partnered with Orbital Insight and Ursa for AI machine learning and deep learning. The plan is to build analytics vertical by vertical targeting Agriculture, Insurance and Oil & Gas and other sectors where monitoring large scale distributed assets is strategic. Planet is the one the few smallsat players with an operational constellation. The startup was the first new entrant to win a pilot commercial data contract from the NGA in 2016 for $20 million with a follow-on for $14 million in 2017 due to its high revisit on a global basis. The company signed a R&D agreement with the NGA this year to develop analytics. While it has launched a beta analytics platform for baseline object detection and change detection, it is looking for partners to develop analytics. Two other new entrants are targeting the defense market when the NGA’s large commercial contract comes up for recompete in a few years. First, Deimos, a subsidiary of UrtheCast, has expanded into analytics with its recent acquisition of Geosys. The company has closed financing of its UrtheDaily constellation, which is design to capture daily medium-resolution optical imagery of the Earth’s entire landmass for change detection. Urthecast already has a backlog of C$300 million over 13 years from customers including Land O’Lakes, a leading US agribusiness company and a satellite operator on the Indian subcontinent for UrtheDaily. The second entrant targeting the defense market is BlackSky, part of Spaceflight Industries, formed a joint venture with Thales and Telespazio a year ago to build and operate a constellation of 60 fast-revisit, 1-meter resolution EO satellites. The company is on track to launch its first two satellites this year. Low price, quick data turnaround and Big Data analytics is the strategy for BlackSky targeting the Defense and Intelligence market. In 2016, BlackSky acquired a software and data analytics company OpenWhere, for its geospatial intelligence platform. Satellogic, a company developing a constellation of satellites designed to provide 1-meter resolution optical and hyperspectral imagery. The company has raised $80 million so far and launched 8 satellites this year. It is its building its own analytics, but open to partnerships and 3rd party data. It has the only hyperspectral cameras in orbit, and is gaining traction in oil & gas, infrastructure, forestry and insurance. SAR startups, ICEYE and Capella, are pursuing vertical integration and developing analytics for change detection. i.e. critical infrastructure and maritime monitoring. They believe smallsats are complementary to the large established constellations as they offer higher revisit and more coverage, another layer of information. ICEYE, a company in Seraphim Capital’s portfolio, is the world’s first company to successfully launch a small SAR satellite under 100 kg. The company’s strategy is to leverage lower cost and high frequency data for global change detection. Capella Space is another smallsat SAR startup planning to launch its first satellite in November after a year delay. As satellite operators transition their business from collecting and selling pixels to actionable insights, startups building AI analytics and value-added services from satellite imagery raised record venture capital of $95 million in 2017, almost up three times from 2016. The four startups that received most of the VC funding last year include Orbital Insight ($50 million Series C), Descartes Labs ($30 million Series B), Ursa Space ($7 million Series A), and Spaceknow ($4 million Series A). Orbital Insight was one of the first AI analytics startups to use DigitalGlobe’s GBDX data platform, using computer vision to extract insights from high resolution satellite imagery. The company sells primarily to the Financial Services and defense markets; it is actively developing other market verticals through partnerships with companies that have domain expertise. The company is growing as fast as a startup can grow and the CEO sees explosive growth from the government as AI has become a critical capability for the US military. The company announced its first acquisition last week of Feature X, an AI company specializing in applying computer vision to satellite imagery to detect objects, enhance images and facilitate deep learning. Descartes Labs is a spin-out from the US government’s research lab to develop a powerful data refinery, geospatial platform that provides analysis ready data for modeling. 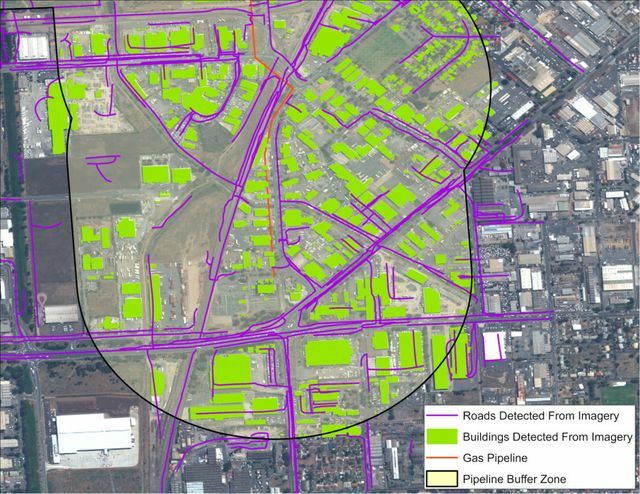 The company grew sales 3x last year, and recently won a $2.9 million contract with a $4.2 million option from the Defense Advanced Research Projects Agency’s (DARPA) for its Geospatial Cloud Analytics (GCA) program, an initiative launched in 2017 to help analysts gain access to and analyze optical, SAR and radio frequency data. Descartes thinks it has a good handle on the data infrastructure; it is focused on recruiting the best people and developing applications and analytics for Fortune 500 companies. Ursa Space is focused on using SAR data to deliver insights to the commercial market. The company’s Series A funding supported tremendous team expanding, the building of its data processing infrastructure. Ursa thinks the industry is just scratching the surface with AI analytics and is seeing interest from a lot of different areas. The company believes that Insurance will be the next big opportunity.